Creeper World 4 development short (as in a short video, not a mission play). This time I’m talking about decayable terrain. will decay settings be per map or can different areas of the map have different decay levels? will it be possible to make it so only terraformed terrain decays, and only down to the initial level? 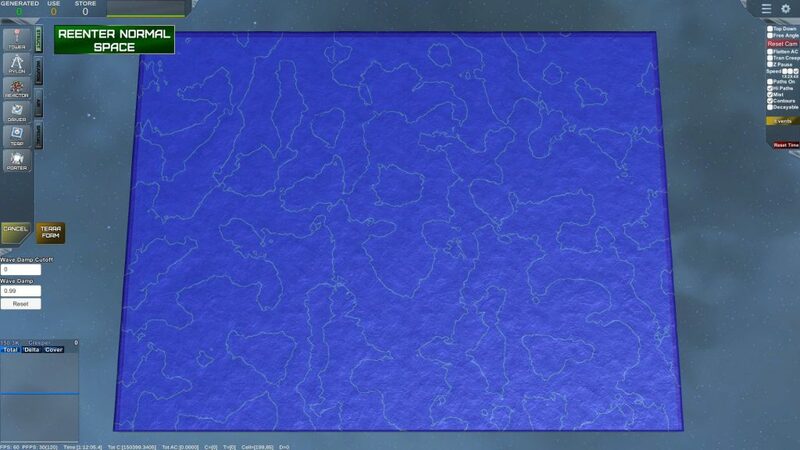 Right now terps don’t interact with decayable terrain (can’t terp terrain that can decay). Don’t know if that rule will change or not. Looks interesting, but also looks like it’d be easy to overuse. Also, one question you’d need to answer (if you haven’t thought of it already) is how terps would interact with decayable terrain. Can they harden it so it doesn’t decay? Can they edit it at all? etc. Basically same answer as I just posted above. Terps can’t terraform decayable terrain. That’s the rule at present, but will be evaluated in greater detail over the coming weeks. There sure are some interesting possibilites. As Ninjadude said, you could harden it to stop or slow the decaying process. It being decayable, I suppose the terrain is not stable enough to build on it with terps, or you could build walls on it which crumble down over time because of the unstabe foundation (would require different textures though). As there is no research the option to unlock such a feature is obsolete, but maybe you could implement different decayable terrain, as cooltv suggested. One like dirt that is impossible to improve, and one that is more stable, therefor decaying slower and being possible to reinforce as long as it’s still above 0. Also, I hope you make it visible without the interface option, maybe with an overlying texture making it look porous. Would it be possible to change creeper breeder settings from a global Var to a painted Var like decay? Perhaps even change beeder settings per height-level. Say that creeper on terrain level 0 = 2/min but creeper sitting on terrain level 5 is only .5/min. With decay settings and a variable creeper breeder, you create rush scenarios, rewarding skillful play by preventing a more powerful breeding source. Also allowing the inverse of decay to be true with either creeper or anti-creeper will increase the flexibility of interesting map design. Can you use decimal or negative values for decay settings? Interesting. If so, perhaps anti-creeper could make it grow. mesmerize indeed. love that ending. all of it actually. Hey haven’t checked in for quite some time but I just ran through your most recent handful of videos. Can’t even tell you how excited I am for this. I honestly have to stay away from the blog for that reason. Everything looks more beautiful and well thought out after every video. I’ve never been disappointed by a new CW. You are a master craftsman. Keep up the great work and I’m sure this installment will blow my expectations out of the water just like the first 3 (and particle fleet) did. Cheers. Just checked steam: 232 hours in cw3, 351 hours in particle fleet. I think it’s fair to say I’m a fan. Haven’t seen a single dev video that hasn’t caused constant hype. The new displays related to energy and creeper levels is f**king fantastic for turtlers like me. Also, gotta mention again that everything LOOKS amazing. Keep up the great work virgil! Will we be able to add terrain to voids? This is something that I wanted to do in CW3, would LOVE to see it. I have hundreds of hours in your games, it is great to be able to purchase and KNOW you will get your money’s worth! Thanks for the updates, missed you all summer, but glad to see you back! If liberation ships can dig through decayable terrain, I don’t see why terps can’t at least erase it. Building on top of it, hmm………..? Also, if there were at least 1 special level in which a unique non-main-arsenal device can be used to add terrain to the void and/or vice versa, I think you’d have something really cool to show off. Another thought, what if anticreeper could make decayable terrain decay-proof? been a huge fan since creeper world 1 was released on kongregate =D. very hyped to see what is coming next. the decayable terrain sounds like itll be awesome to have in the series. also a question which i will pose in the discord soon is considering the 3D style of the game was there ever a consideration to make terrain such that it is handled on a by layer fashion, perhaps to allow creeper to flow under a high piece of terrain? or perhaps a mini-cave system? would a level designer (maybe not a player/terp) be able to do something to cause this effect? why or why not? if it was considered but later scrapped was it because of a technical difficulty or a game design choice? This is a great idea. Walls are always a safe haven, it could be nice to play on that. Nothing is sacred. It would be really neat if terps land were by default decayable. I really appreciate that you took the time to redesign units instead of just re-implementing them. The airfields and terps, for example, are a really great re-write. You really need a lot of space to place an airfield now. I am aware of the feature creep *pun intended but with your current implementation, I thought two new weapons would add an interesting dynamic. 1.) Heat laser or some such thing. Instead of firing in a burst and causing a ripple through the creaper, it would continuously fire cooking off creaper. 2.) Inverse crawlers. A unit that produces uncontrollable crawler units. Essentially the inverse of what you have for crawlers now. Just a couple of ideas. Keep up the great work! crawlers? i don’t remember anything called that. Could there be an option along the line of “make decayable down to level X” or “top X levels decayable, rest normal”? That way a peaked mountain could be tweaked to erode to a still elevated plateau. Apologies that I don’t have much time, but I wanted to say thank you for the video. I like very much what I saw and the features. Thank you for making what I expect will be an even greater game than before. What would happen if the terrain dissolved into empty space and is that possible? Keep up your good work! 1. Have the opposite of this, where when creeper encounters terrain, it will instead grow up to a certain height. 2. A option to specify whether the decay/grow is caused by Creeper, Anti-Creeper, or both. I think that those would cause some interesting possibilities for maps. Great work, really looking forward to it! Will this be a mobile app?